Scenic Photos of Grand Teton National Park one of the prettiest places in the world. Grand Teton National Park it truly one of the National Park systems crown jewels. It is located in northwestern Wyoming and preserves a spectacular landscape rich with majestic and famous mountains, pristine lakes, and extraordinary wildlife. 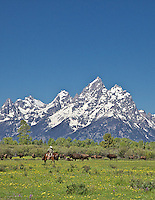 The abrupt vertical rise of the jagged Grand Teton Mountain Range contrasts with the sage-covered valley bottom and glacial lakes at their base, creating world-renowned scenery that attracts nearly four million visitors per year. Rising more than 7,000 feet above the valley of Jackson Hole, the Grand Teton Range serrate Grand Teton Park's skyline in a very dramatic. The mighty Snake River winds its way down the valley providing stunning views of the mountains around every bend. The elevation of the park ranges from 6,400 feet on the sagebrush covered valley floor to 13,770 feet on the windswept granite summit of the Grand Teton. Natural processes, wind, snow, ice, and rain, continue to shape Grand Tetons Mountains and valleys.